Tom Okarma may be out as Geron's CEO but he has a nifty cushion to ease the pain. Reporter Ron Leuty of the San Francisco Business Times has reported that the onetime head of the Menlo Park stem cell firm could receive up to $1.3 million, including $802,500 in severance pay, as part of an agreement with the firm. The package consists of consulting fees, reimbursement of legal fees, health care coverage plus an additional $24,000 for benefits not covered by Medicare. He also has stock options that Leuty reported would have been worth more than $3.9 million if cashed out at Wednesday's closing price. Nature magazine's blog, Spoonful of Medicine, yesterday carried an item on selection of a chair for the $3 billion California stem cell agency to replace Robert Klein, who has headed the enterprise since 2004. In her piece, Michelle Pflumm covered ground that was familiar to readers of the California Stem Cell Report, but offered additional material with interesting perspectives. The headline on her item read "CIRM board members at odds over future chair’s duties and salary." The item was published prior to yesterday afternoon's meeting of the board's Governance Subcommittee. "Twenty of 29 board members filled in the survey(for criteria for a new chair). Of those who did, most cited leadership and a history of stem cell advocacy as the most important skills needed in the next chairperson. However, a handful of members listed scientific know-how as the prime desired qualification. Under the terms of Proposition 71, the 2004 ballot initiative that led to CIRM’s creation, the chairperson must have a 'documented history in successful stem cell research advocacy.' No mention is made of scientific proficiency." "Additionally, the CIRM board members had differing opinions over how much power should sit in the position of the incoming chair. Eight survey respondents said the president should report to the chair, while only three thought the chair should report to the president. The remainder called for a more collaborative arrangement. "In the past, critics have charged Klein with exerting too heavy-handed a role on the agency and not granting the president sufficient independence. As Joel Adelson, a health-policy researcher at the University of California-San Francisco, told Nature last year: 'Klein… acted like the chief operating officer beside (CIRM President Alan) Trounson and beside [former CIRM president Zach] Hall, and I can only say that this looks like it must have been very uncomfortable for these guys.'" A key group of directors of the $3 billion California stem cell agency today recommended criteria for a new chair of the research effort, including a proposal that the position remain part-time. Don Gibbons, chief communications officer for CIRM, said in an email that the salary range would remain unchanged under the proposals approved by the directors' Governance Subcommittee, with a top of $500,000 and a bottom of the $275,000. That would translate to $137,500 to $400,000 on a 50 percent to 80 percent work basis, as recommended by the panel. The top attributes identified by the subcommittee are in the categories of "collaborative/consensus builder, leadership/vision, knowledgable/intellectually curious." The top desired skill sets are "advocacy, leadership/vision, scientific expertise/knowledge (defined as understanding), governance expertise/knowledge," Gibbons said. The criteria were recommended following a survey of the 29 CIRM directors. Twenty directors and alternates responded. Gibbons said the subcommittee "agreed to postpone a recommendation on the allocation of responsibility between the chair, vice chair and president until legal staff drafts further language for posting and distribution prior to another subcommittee meeting." Prop. 71 legally dictates overlapping responsibilities between the chair and president, which have been a source of friction at the agency. The state's good government agency, the Little Hoover Commission, has recommended changes to ensure greater accountability and more effective management at the agency. Robert Klein, lawyer, real estate investment banker and the chairman of the $3 billion California stem cell agency, has produced a remarkable document that details how he reaches deeply into CIRM operations on matters ranging from its economic impact to employee travel policy. The 9-page, single-spaced memo was prepared for this afternoon's meeting of the directors' Governance Subcommittee meeting on criteria for the person who is to replace him in June -- if not sooner. The document was posted on the CIRM web site yesterday. In the memo, Klein chronicled what he described as his "routine" activities for CIRM. Writing in the third person, he indicated that he attends virtually every public meeting involving CIRM in addition to many closed-door sessions. Another document offered earlier by Klein lists a host of meetings that he believes the CIRM chair would need to attend this year. The time required runs to about 12 business weeks of meetings with about another 24 weeks required for preparation, according to the document. Klein's memo said he delved heavily into preparation of the recent rosy report on the economic impact of CIRM. He said he examined its "technical accuracy" and "strategic implications for participating companies, including those with publicly traded stock." "In every board, subcommittee and working group meeting, the chair provides continuous, 'real time' legal guidance to the discussion, monitoring and suggesting phrasing and specific, descriptive wording that is consistent with the agency’s litigation record and constitutional/statutory authority." "The complexity of (policy) reviews generally requires the coordination of four or more external and internal legal perspectives to avoid esoteric state statutory and/or judicial conflicts, political sensitivities." He is responsible for all the board agendas. He reviews each request for information under the state public records law. He monitors "the number of board members who discuss a particular topic outside of a noticed meeting." He is currently personally developing PR plans connected to what will be CIRM's first-ever entry into clinical trials. In his memo, Klein sketched out his strategy to deal with "any negative announcement" – presumably death or grave illness – coming out of a CIRM-funded clinical trial. He said CIRM must be prepared "to assure the public that the predictable, sensationalized news turbulence surrounding any negative clinical trial event should not derail vital medical progress, with appropriate safeguards." In 2008, the CIRM board defined the chair's job as a part-time, 50 percent position. Klein was paid $150,000 annually under those terms. Prior to that he took no salary. In December, the CIRM board extended his term into June, but at no salary. "An agency governance structure that features key positions built around specific individuals does not serve the best interests of the mission of the agency or the state of California, however well-qualified the individuals may be. Such a situation distorts accountability and succession planning and could, in the event of an abrupt departure of the individual, leave the agency leaderless for an extended period." More on Positive Feedback Loops at CIRM or "Them That Has Gets"
Last week, we wrote about whether "feeding the well-fed" would produce the kind of results desired by the California stem cell agency. 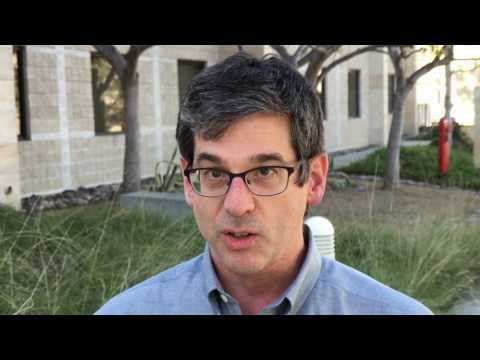 The starting point was an item by UC Davis stem cell researcher Paul Knoepfler who discussed on his blog the general grant-making process in the world of science. He said that the process rewards those who are already well-funded while greater impact could be had by refocusing on newer researchers. Knoepfler subsequently pointed to an NIH piece that drew substantially the same conclusion based on its own study of grants. "...analysis plots the median number of publications between 2007 and mid-2010, and the median average impact factor of those publications, against total direct NIH funding in 2006. It covers 2,938 investigators, who were divided into 14 groups on the basis of their funding level. "The resulting plot shows that both measures peaked at around US $750,000 in annual funding; at higher funding levels, the median publication number and average impact factor were both discernibly lower." The California stem cell agency has unveiled the results of a survey of its directors concerning their own performance and desired criteria for a new chair of the $3 billion research effort. "The survey reveals that members have a wide range of views, especially in connection with the allocation of responsibilities between the chair and vice chairs, the board, and the president, and the appropriate time commitment and salary for the new chair. The survey also suggests, however, that members are more aligned with respect to the desired attributes and skills for the chair. For example, ten members identified the ability to collaborate as the most important attribute for chair. In addition, ten members concluded that advocacy skills are critical for a new chair, while 12 members indicated that leadership skills are also important. " Only 20 members of the 29-members of the board and/or alternates responded to the survey last week. CIRM did not specify the number of alternates who participated. The results were posted yesterday, just two days before tomorrow's meeting of the directors' Governance Subcommittee. The panel is in the process of determining criteria for a new chair to present to the full board, probably in March. Results of the survey can be found here and here. Some of the questions and responses spoke to the problem of overlapping responsibilities of the chair and the president, which are locked into law by Prop. 71. In the past, those ticklish issues have sometimes surfaced in public. Based on the survey, board members seem to prefer more delegation and less operational activity on the part of the chair. "CIRM has 'grown up' enough that we can now clearly define responsibilities. The chair should oversee and guide, and empower the president to be the true CEO of CIRM. Judicious interventions will be more effective than micro-management." "While the designated effort is 50 percent, the role of the chair has been expanded so that the actual time probably exceeds 100 percent. This makes for confusion between the chair, president and others. The board chair's role should be to oversee the governing board, not manage CIRM. This percent effort should not exceed 50 percent." Salary suggestions ranged from $50,000 to $550,000, depending on the time commitment. Salaries are a hot button with the public, and the top scales at CIRM have triggered concern from various parties in the past. "One member cautioned that, given the state's current economic circumstances, the chair's salary should be kept at a minimum level, while another member expressed the view that the board must be prepared to compensate the chair appropriately if it wishes to attract a great leader. One member added that limiting the compensation paid to the chair would enhance public trust and another member stressed that the board should look for candidates who do not require a high salary." The survey identified "advocacy" as the most desired "skill" in a new chair. "Leadership/vision" ranked third with scientific expertise third. In the "attributes" category, the top, desired attribute was "collaborative/consensus builder" with "leadership/vision" and "knowledgeable/intellectually curious" coming up two and three. As for the board's self-assessment, 90 percent agreed that that "CIRM lives up to its mission." (The survey had a choice of yes, sometimes or no on the statements.) A significant percentage of respondents indicated some areas of concern. Fifty percent agreed that the board is "too influenced by the views of the president and/or other management staff." Only 25 percent said "yes" to the statement "board members have appropriate input into the preparation of the agendas. While 65 percent said they "feel comfortable raising and discussing dissenting or contrary opinions," 35 percent said they agreed only sometimes with that statement. Still missing from the Governance's meeting agenda for tomorrow are proposed changes in CIRM's governance policies, which could include issues related to the chair. The California stem cell agency was admonished in December by the state's top fiscal officer concerning its performance in attempting to elect a new chair to head the $3 billion enterprise. More transparency and openness are needed, said State Controller John Chiang, chair of the only state panel specifically charged with overseeing CIRM finances. That advice is going unheeded this week. With only two days left before a key meeting concerning selection of a new chair, left in the dark is the California public – not to mention biotech companies, researchers, patient advocates and state policy makers, and all of the stakeholders in stem cell research. The agenda for Thursday's meeting of the directors' Governance Subcommittee contains little more than hints at what it is to be considered. The lack of information makes it difficult – to put it mildly – for interested parties who have other business on their plates besides CIRM to come up with thoughtful and constructive comments. The subcommittee is scheduled to consider a survey of directors' preferences on recommended criteria for the person who is to replace outgoing chairman Robert Klein next June. It is also scheduled to consider changes in the agency's internal governance policies. That's all the information available this morning to the public on the CIRM web site, although the agenda does not even actually mention the survey. No results of the survey, no recommended criteria, no proposed course of action, no language on on the changes in governance -- much less a justification -- are available to the taxpayers of California, who are paying for CIRM's operations. Unfortunately, CIRM's performance this week on this matter is no exception. The agency has a dismal record when it comes to providing the public with access to information on what its directors are to consider. It comes late or not at all. Often no justification is presented for proposed actions. The issues are not minor. They involve the agency's most important actions and determine its current and future direction. Has CIRM Funded Stem Cell Research that Bush Would Have Banned? When California voters approved creation of an unprecedented, $3 billion stem cell research program more than six years ago, they were told the money would go to finance research that then-President George Bush had banned. Has that actually happened? Yes, but mainly no, according to a research paper published in Nature Biotechnology in December 2010. In the first-ever such analysis of CIRM grants, Aaron Levine, assistant professor in the School of Public Policy at Georgia Tech, reported that through 2009 only 18 percent of California's dollars went for grants that were "clearly" not eligible for federal funding. Levine's finding has implications for another, multibillion-dollar bond ballot measure that CIRM Chairman Robert Klein has proposed. The campaign for such a measure would have to address the question of whether the promises of the 2004 ballot initiative that created CIRM have been fulfilled. CIRM does not offer on its web site figures that can be compared to Levine's calculations. The agency does present some statistics about the amount of funding for embryonic stem cell research, but makes no effort to break out the percentage of grants that would not have received funding during the Bush years. Levine's numbers on California were part of a broader look at state funding of stem cell research in recent years. He reported that by the end of 2009, six states had awarded nearly 750 grants totalling $1.25 billion. California accounted for $1 billion of the total. Per capita funding amounted to about $1 in Illinois and nearly $28 in California. "Most state hESC funding appears to have supported research also eligible for federal funding during the Bush Administration. This finding is surprising, given the explicit intent of several state programs to preferentially support science not eligible for federal funding, but likely reflects the nature of the grant proposals state agencies received, particularly given the number of grants states awarded to scientists relatively new to the field of hESC research. "Several factors could explain the relatively small share of grants that went toward clearly ineligible research. Some scientists who wished to pursue this research may have been unable to access the raw materials or acquire the intellectual property rights required to do so. Alternatively, these findings could simply reflect scientific interest. The discovery of induced pluripotent stem cells may, for instance, have reduced scientific interest in the derivation of new hESC lines. Finally, these findings may reflect a preference on the part of scientists to use well-established and well-studied hESC lines. This last explanation may be particularly relevant for new scientists entering the field of hESC research, as using recognized cell lines may give their initial research efforts greater credibility." In California, another factor enters into funding for Bush-banned research, particularly given the 2004 campaign promises. CIRM makes overt decisions about what to fund. Its RFAs spell out what is acceptable and non-acceptable. The agency could have specified that it would not fund any research that would be eligible for federal funding. But whether that would have been "good science" is another question. CIRM also spent nearly $271 million on new labs at many of its directors' research institutions, diluting the percentage that would be construed as financing Bush-banned research. We are querying CIRM concerning Levine's statistics. Levine also reported that the state stem cell research efforts appear to have drawn new scientists into the field, with the largest impact occuring in California. He wrote that 42 percent of those funded in this state appeared to be fresh to the field. "While CIRM already makes this information readily accessible, some of the other state programs do not and I hope this database will facilitate comparisons among the various programs and prove to be a useful tool for people interested in state stem cell programs. " A key group of directors of the $3 billion California stem cell agency meets in just four business days to consider one of the more important matters facing the unique research enterprise. The Governance Subcommittee will take up the criteria that directors would like to see in the next chair of the agency – the person who would replace Robert Klein, the longstanding (since 2003 or so) presence behind CIRM. Klein has announced that he will retire as chair in June. The directors' subcommittee is scheduled to convene next Thursday to act on a survey of board members concerning their preferences for a new chairman, preferences that would be in addition to the legal requirements. Directors are hamstrung by law in their choice of a new chair. They must pick from candidates nominated by four statewide officials: governor, treasurer, controller and lieutenant governor. That requirement is part of Prop. 71, which created the stem cell agency and which was written by Klein and a handful of his associates. So far, the public is in the dark about the results of the survey of directors and other details that the subcommittee is scheduled to consider. The agenda says only that "criteria and parameters for chair of CIRM’s governing board and process and timeline for consideration of nominees for chair of CIRM’s governing board" are on the table. Also on the agenda is what may be a related matter, but its significance is masked by its cryptic language, which consists of only seven words: "Consideration of amendments to Internal Governance Policy." CIRM directors are taking a fresh look at selection of a new chair in the wake of the unseemly affair last December that resulted in a spate of negative news stories when Klein attempted to hand pick his own successor. At the time, state Controller John Chiang, head of the only state entity specifically charged with overseeing CIRM finances, said in a letter to the board that the chair selection process was "fundamentally flawed" and should be restarted in a way that is open to the public. "The ICOC has a responsibility to the taxpayers of California to conduct its business in an open and transparent manner." The California stem cell agency recently trotted out a rosy report that it commissioned about the beneficial impact of its $1.1 billion in spending so far. CIRM's spin, however, is somewhat different than the perspective from the Pacific Research Institute. K. Lloyd Billingsley, editorial director of the San Francisco "free market" organization, said the CIRM report is "a confession that CIRM is a bust at its original mission." "CIRM is an insiders’ club essentially accountable to no one, and its job and revenue claims remain dubious. The federal government now funds embryonic stem cell research, calling into question CIRM’s reason for existence. Adult stem cell research also continues at many institutions, delivering cures and therapies CIRM has failed to produce and remains unlikely to deliver." Folks like Billingsley are unlikely to be ever persuaded that CIRM will produce results that justify its existence. Few of them are speaking out now, but they will surface in a major way once a ballot campaign for a $3 billion to $5 billion CIRM bond measure is underway. It's a "challenge," as they say, for the agency. Billingsley and his sympathizers will be not back off even if the results of a proposed Institute of Medicine study and a performance audit handily endorse CIRM. Both will be commissioned by CIRM. That means their independence will always be questioned. Looking for a roundup on stem cell firms and their activities? You can find a brief one on the blog of a stem cell scientist at UC Davis. In a piece called "stem cell biotech updates," Paul Knoepfler mentions the surprise departure of Tom Okarma as president of Geron Corp. of Menlo Park, Ca., declaring that it means a "fundamental change" at the firm. On the same subject elsewhere, Rob Waters and Elizabeth Lopatto of Bloomberg News quoted one stock analyst, Ren Benjamin of Rodman & Renshaw about the move. "'Clearly there was a difference of opinion as to how the company should move forward,' between Okarma and the board, Benjamin said in a telephone interview today. 'The board wants to take a more strategic focus on partnerships with a keen eye on the cash spend and position.'" "Insiders see Pfizer's change of heart as a tipping point that will lead to many industry partnerships with holders of stem cell patents." Feeding the Well-fed: Will It Produce the Results CIRM Wants? It's pretty easy to tell where the sweet stuff is going when it comes to the California stem cell agency. Take a quick look at CIRM's list of grants and their recipients. Stanford, UCLA and UC San Francisco top the list with $437 million out of the $1.2 billion the agency has handed out so far. The agency has not blessed its fans yet with a list of individual scientists and their totals, but it would be a fair guess to say that the already shining stars of stem cell research are taking home most of the cash. Of course, there are notable exceptions to the magnetic attraction of the big guys and their academic homes. The question arises, however: Is this really the best way to produce cures and develop breakthrough science? It is also a question that can be raised in connection with the NIH and other sources of funding for scientific research. Feeding the already well-fed can mean starvation or least malnourishment of challengers who have fresh ideas that may not fit with the prejudices of the mainstream. And some of those challengers are likely to crack difficult issues and find solutions that have eluded those who may appear to be frontrunners. This subject – sometimes called a positive feedback loop, otherwise known as "Them That Has Gets" – popped up in an item yesterday on the blog of UC Davis stem cell researcher Paul Knoepfler, a beneficiary of CIRM largess. 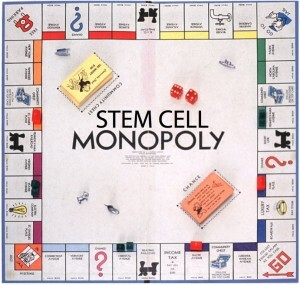 The title of his item is "Stem cell monopoly: do not pass go, do not collect $200,000." "...is inherently biased to reward scientists who already have funding with more funding. It also rewards institutions that already have a lot of funding with even more funding. "Any given grant application as a whole is viewed through the filter of who the applicant scientist is and where they are doing the research. This bias tends to concentrate research funding, giving certain people and places a disproportionate share of funding. "So one might ask 'if these scientists and institutions are the best, doesn’t it make sense that they should get more funding?' The simple answer might be 'yes,' but if you dig deeper you realize that for the stem cell research field as a whole, the answer is 'no.'" "Someone once said 'there is no monopoly on good ideas.' This is certainly true in the stem cell field and there is no monopoly on good science either. Well-funded people and places may have the best grantsmanship, but do not necessarily have the best ideas and are not necessarily the best equipped to do the science. Even so, funding agencies create an environment where certain institutions are rewarded with so much funding that virtual monopolies are created. In so doing the funding agencies end up with less diverse portfolios and lower their impact on the field." Knoepfler argued that the first dollars make the biggest impact and that their effect drops sharply as a grant moves into its later years, a position that one scientist agreed with in a comment on the blog using himself as a case in point. Knoepfler suggested a funding philosophy that would tilt towards greater "funding impact" as opposed to continuing to stuff the coffers of the already well-off. Knoepfler's piece drew some interesting reaction on his blog. One person said Harvard and Stanford receive all the cash because they "are simply better and deserve more funding. Period." One reader, "WTF," went to the CIRM list that shows Stanford, UCLA and UC San Francisco at the top. But WTF went further and noted the next 11 institutions altogether have not received as much funding as the top three. Reviewers at the $3 billion California stem cell agency tomorrow morning meet behind closed doors to consider applications from four biotech businesses seeking as much as $25 million each in the agency's first-ever clinical trial round. Geron Corp. of Menlo Park, Ca., and Advanced Cell Technology of Santa Monica, Ca., are likely to be among the applicants, whose names have not been disclosed by CIRM. The agency generally clamps a lid of secrecy on applications until after they are officially approved by its full board, saying that rejected applicants might be embarrassed. Another possible applicant, iPierian Inc., of South San Francisco, told the California Stem Cell Report that it had not applied for funds in the $50 million round. CIRM says it hopes to award up to $25 million to one or two applicants, although the CIRM board may well change that. The funds are scheduled to come in the form of loans, whose terms were recently changed by CIRM and can be found here and here. The number of applicants is small (CIRM said only four) because the round is limited to those who "have filed an Investigational New Drug application for the human pluripotent stem cell-derived therapy," according to the RFA. CIRM will accept trials involving both human embryonic stem cells and induced pluripotent stem cells. Both Geron and Advanced Cell Technology have filed the required applications. Ipierian's former president at one point indicated that the company might apply. However, in response to query last week, a spokesman said the firm had not applied. Geron and Advanced Cell Technology did not respond to questions. The round is part of a high stakes effort by CIRM to push stem cell therapies into the clinic. More clinical trial rounds are expected in the next year or so. The ballot measure that created CIRM in 2004 appeared to promise speedy development of cures. CIRM is trying to fulfill that promise plus generate voter support in financially troubled California for another $3 billion to $5 billion bond measure. An external review of the agency last fall also called for closer ties to industry to bring therapies to market. CIRM's clinicial trial round was originally scheduled to begin accepting applications in the spring of last year. The RFA was not posted until August. The agency has never responded to multiple requests for an explanation of the delay. The round has not been without controversy. CIRM hired a former Geron executive, Laurence Elias, as a $50,000 consultant on the round. The agency said no conflict interest was involved. Geron's clinical trial involving an hESC therapy for spinal injuries is well underway. Stanford and the Santa Clara Valley Medical Center joined the effort last month. Advanced Cell Technology is working on therapies for macular degeneration and is the only company with two hESC trials. In December, its longtime CEO, William Caldwell, died unexpectedly. 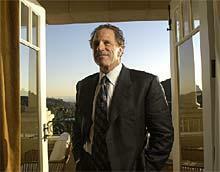 Gary Rabin, a member of the firm's board of directors, has stepped in on a temporary basis. Tomorrow's meeting will be the first review session for CIRM's new vice president of research and development, Ellen Feigal, formerly of Amgen, who started work on Jan. 31. Feigal is expected to be the agency's lead on commercializing stem cell research. "They will likely succeed or fail in a very big way, and advance or set back the science of HESCs forever." Both Geron and Advanced Cell Technology have generated considerable interest among small investors who follow and discuss them via Yahoo investment groups. Geron's closing price on Friday was $4.91, down from its 52-week high of $6.44. Advanced Cell, which moved its headquarters to California seeking CIRM funds, closed at nearly 18 cents, down from its 52-week high of about 27 cents. Applications for CIRM's clinical trial round could be officially approved as early as the May 3 meeting of the CIRM board in Los Angeles with checks going out this summer. No announcements are expected tomorrow following the review session. Two California state entities involved with the state's $3 billion stem cell agency examined its progress last week, ranging from its biotech loan program to election of a new chair. The bodies are the Little Hoover Commission, the state's good government agency, and the Citizens Financial Accountability Oversight Committee(CFAOC), the only state body specifically charged with the overseeing CIRM's finance. The CFAOC, chaired by state Controller John Chiang, queried CIRM officials, who included co- Vice Chairman Art Torres, President Alan Trounson and outside counsel James Harrison. Topics included the agency's heavy reliance on outside contracts(particularly in connection with legal and communications activities), the biotech loan program and its returns to the state and conflicts of interest, particularly in connection with closer ties to industry, according to Ruth Holton-Hodson, deputy controller. We expect to have more on the discussion when the CFAOC posts transcript from the meeting.